The fear of pandora’s box. As a 20 something, I saw the chains around my mother’s life one day and she told me that her baggage from childhood was stopping her from making friends and had done all her life. So I asked her, why don’t you get some help and deal with it? She stiffened, up came the wall and as she walked away I heard ‘Not opening that pandora’s box’. Sure it can be painful to go there, that’s why you buried it in the first place. But here’s a point to ponder: you most likely buried it as a child when you had few skills to do otherwise and lots of adults telling you that’s what you should do. Now you’re an adult. You may have developed ways of avoiding that pain, avoiding situations where memories of the pain might surface, avoiding people who might inflict that same sort of pain and living in fear of who you might trust or not. So is the burying thing really helping you now? Uh huh. But what if in dealing with it, you have to feel the pain all over again? Well what if the fear of reliving the pain is way worse than the actual event? Remember, it’s had many years of you creating added layers to it so it’s quite possible that what’s in the box is actually manageable with some changed thinking. When you’re on the other side of letting it go, you might just wonder why you gave half your life to dodging it and be in awe of yourself and your ability to change. At this point you may decide to gingerly stick a hand up out of the doona and ask how? How do you navigate through the box of pain? My journey was very long winded. I wasted a lot of time finding the people who would support me hiding in illness. When I got sick of being sick and faced the reality of another 50 years of that, I decided I was ready to find people who would give me the truth of what I was doing to keep myself sick. Confronting? Yep. Guess what? You are stronger than you have learnt to believe you are. I have a client who is blooming right now and it is sheer joy to watch. 2 years ago she was full of anxiety, limiting her life at every opportunity, surrounded by the walls she had built. We started with a garden, building hope and beauty that spoke to uplifting, loving memories. We fed excitement in winter with plans for spring and talked of a quiet retreat space to curl up and just be. 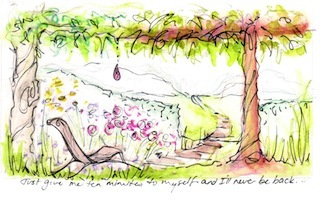 In time, the garden became reality and she buried herself in planting, tending, nurturing. It brought such joy that the contrast between the feeling of being in the garden and not was unbearable. With the strength from this joy came the desire to unpick the anxiety and so we began with confronting what creates it. She is now aware of when her behaviour is an old reaction to a well worn button someone has pushed inadvertently. Now the choice is to react differently. The smile on her face when she does it and does it again is just priceless. The effect on her life is beautiful. I work as a Healing Garden Designer, a Spiritual Counsellor and a Hahnemann Healing practitioner and trainer. It makes sense. I can’t help someone open up and then not share the road out. What’s in your pandora’s box and how much life will you give to it?